Event Information: If anyone wants to purchase a ticket please text Wendy @ 225-266-3855. The above website will have details of the trip, not the raffle! High school juniors and seniors are invited to write a 5-7 minute speech on a pro-life topic (as listed in guidelines). They will deliver their speech in front of a panel judges on April 25. The winner will go on to participate in the state wide competition! For guidelines, entry form and more information, contact Shanon Snyder with Louisiana Right to Life. The merciful love of God is the very heart of Sacred Scripture. Our Merciful Father has been calling Hs children back to Him through the prophets of the Old Testament, through His Son, Jesus Christ, and through His Church. The message of the Prodigal Son comes alive on Divine Mercy Sunday as the Father opens His arms to receive us back without punishment. of tenderness. It is My desire that it be solemnly celebrated on the First Sunday after Easter." The grace of Divine Mercy Sunday has been compared to the grace of Baptism. It forgives all sins and provides for the removal of all punishment due to sin (even for sins forgotten to be confessed). “Extravagant Mercy” an Easter Mission with Sister Terry Falco, RSM beginning Divine Mercy Sunday. ** Sister Terry Falco is Program & Hospitality Director of the Carmelite Spirituality Center in Lacombe, LA. She holds a master’s degree in Liturgy from University of Notre Dame & is certified in Spiritual Direction. Event Information: Representatives from government, the media, and churches of all denominations will gather to pray for our country. This is an annual event held throughout the United States on the first Thursday in May. Event Information: St. Isidore Catholic Church is having a huge indoor garage sale Friday through Sunday, May 3rd.-5th. The sale will be in the Ott Center (our gymnasium). We have antique items, books, toys home decor. You name it, we'll have it! Profits benefit St. Isidore and our ability to give back to our community. The MIR Group Presents: Fr Dave Pivonka TOR Movie Screening for "Signs of Contradiction"
Event Information: Fr Dave Pivonka TOR is well known for his Wild Goose series and travels the world sharing the gospel. This movie is about St Francis of Assisi. The movie will be shown, discussion to follow. Refreshments will be sold. All proceeds and love offering go towards helping support the young, young at heart, and seminarians defray the cost of their pilgrimage to Italy & Medjugorje this summer. All are welcome. 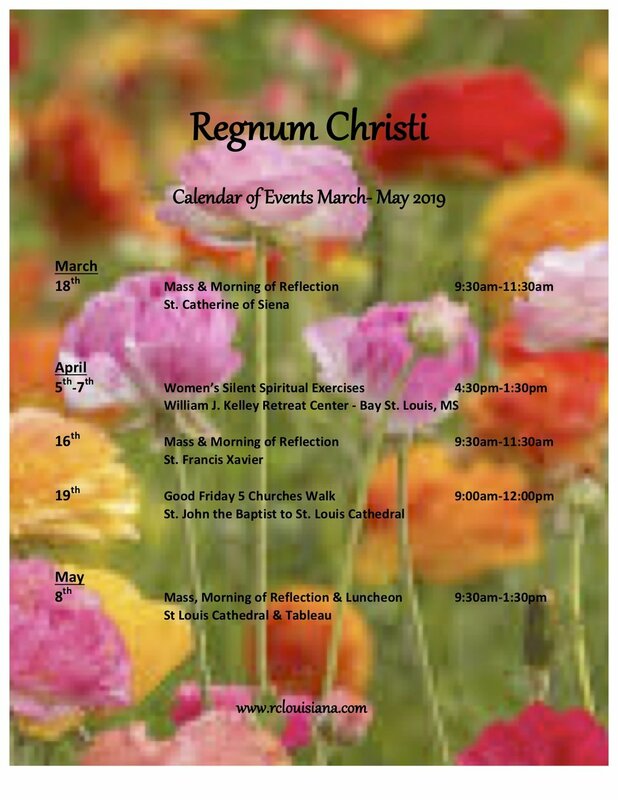 Event Information: Come join us the FIRST SATURDAY OF EACH MONTH for Eucharistic Adoration and Benediction! St. Alphonsus will celebrate the Rite of Eucharistic Exposition and Benediction in the Church. This Rite will last about 30 minutes and will include 10 minutes of Adoration for personal prayerful reflection. All are invited: families, children of all ages, grandparents, singles and married couples. Join us for donuts after Adoration in the St. Francis Room. Event Information: St. Isidore the Farmer Catholic Church is having their annual Car Show Saturday, May 4th from 9 AM to 2 PM. We will be giving prizes out to most unique in motorcycle, truck, and car. We will have a 50/50 raffle and a jambalaya cook off. Proceeds benefit St. Isidore and our efforts to give back to our community. St. Ben’s Golf Tournament, May 16, Covington Country Club, 10am shot-gun start. $100 per golfer, $400 per team. Call 985-867-2284 for more information. Event Information: Every fourth Friday between the months of Feb and Sept, SMM Men’s Club open’s up the Church's parking lot for Car and Bikes to have a place to meet and show off their vehicles. Have 50/50 drawing, food and music during the event and every 30 minutes will be giving away bike/car products. So if you have a vehicle you are proud of or just like to see some great looking vehicles, come on out. Can provide a flyer with additional information. National prayer vigil on the sidewalk outside of Planned Parenthood in New Orleans on Claiborne Ave. Link below has all the information or visit ProtestPP.com. Event Information: For teams liking to competed, teams are 5 person teams at $300.00 a Team and has to be prepared to boil 4 to 5 sacks of crawfish. Crawfish will be provided, all other material teams must bring. To attend event, pre-sale tickets till Apr 12th is $20.00 adults, $10.00 Children (ages 7-12) and under 6 years old free admission. At the gate cost is $25.00 adults, $12.00 Children (ages 7-12) and under 6 years old free admission. 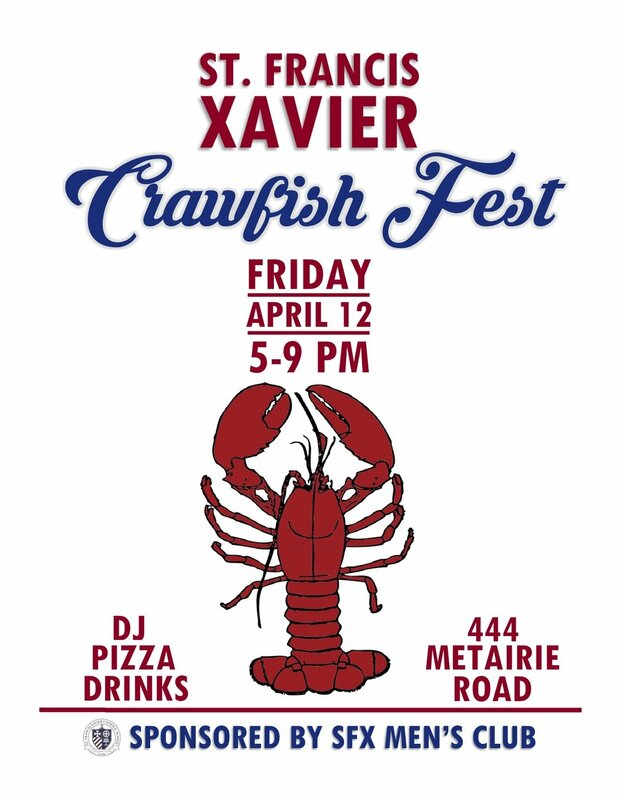 Will have live music, rock climbing wall, beverages (beer, water and soda) and pizza for those that do not like crawfish. Have flyer with additional information if needed. St. Anselm Catholic Church, 306 St. Mary St., Madisonville, LA 70447. Lenten Mission, Fr. Tony Rigoli, O.M.I., V.F., speaks on Crossing the Highway to Heaven – Stop, Look and Go! Free and Open to the Public, April 8, 9, 10 at 7:00pm nightly. Confessions heard on April 10. For more information, please call 985-845-7342. Event Information: Bishop Michael Duca, Bishop of Baton Rouge, invites you to join him Friday, April 5th, 7:00 pm, at St. Joseph Cathedral, for the Way of the Cross in Reparation for the sin of sexual abuse within the Church and for the graced healing of body, mind and spirit for those betrayed by that great sin. All are welcome to attend and/ or to join the Bishop in prayer at that time, on that day. Event Information: This eighth annual presentation of the Passion of Christ features individuals who will identify with a specific station through real-life challenges and sufferings. Event Information: St Peter Catholic Church invites mothers and mothers-to-be to nurture the vocation of motherhood by sharing in a Catholic Book Study for moms. The truth about parenting is that you don’t have to get everything right and your family doesn’t need to be perfect. Colleen Duggan reveals lessons learned through years of struggling with unrealistic expectations in her book, “Good Enough is Good Enough, confessions of an imperfect Catholic mom”. Learn about God’s wonderful plan for the vocation of Catholic Motherhood on Fridays, January 25, February 1, 15, Much 18, 22 and April 5, 2019 from 9:15 a.m. to 11:00 a.m. at St. Peter’s Upper Room located at 318 Jefferson Avenue in Covington. The registration fee is $30 and includes the book. Scholarships are available. 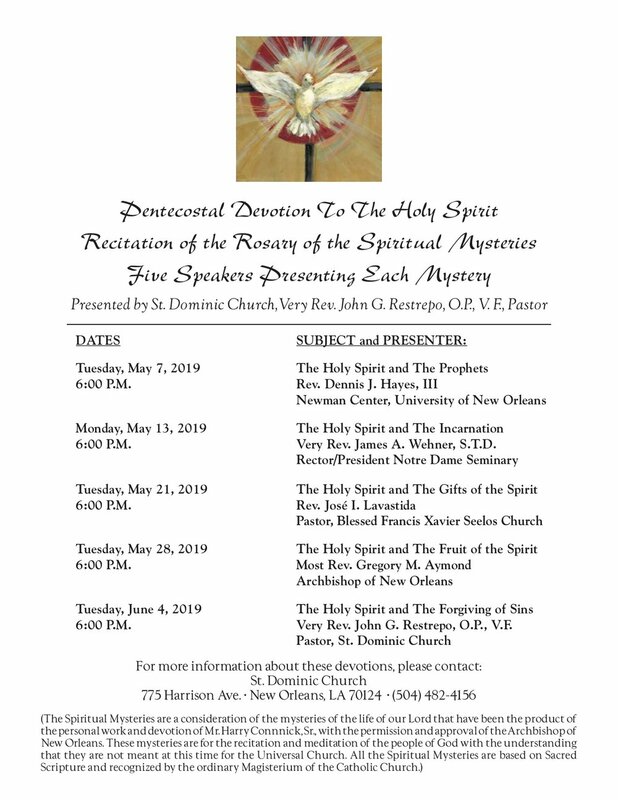 For more information and to register, please contact Beth Montelepre, 504-220-4626 or St Peter Rectory, 985-892-2422. Event Information: Join us as we discuss Human Cloning & Stem Cell Research at the April Respect Life Gathering on Thursday April 4 at 6:30pm at Our Lady of the Rosary Catholic Church in Vincent Hall at 1324 Moss Street in NOLA. Yvette Fouchi, St. Edward the Confessor Respect Life Coordinator will be presenting “Biotechnology: IVF, Stem Cell, & More.” Please join us for an evening of prayer, networking, & learning about Conscience Protection & the Life Issues! Light refreshments will be provided. Come join our exciting mission to form the next generation of Catholics! Regina Caeli Academy (www.rcahybrid.org) provides a classical, hybrid education in the Catholic tradition. Pre K3- 12th grade students attend Socratic, hands-on classes taught by trained tutors two days a week and homeschool on the remaining days. Event includes tour, classroom observation, and Q&A; children welcome! Location: 42021 LA 621, Gonzales, LA 70737. 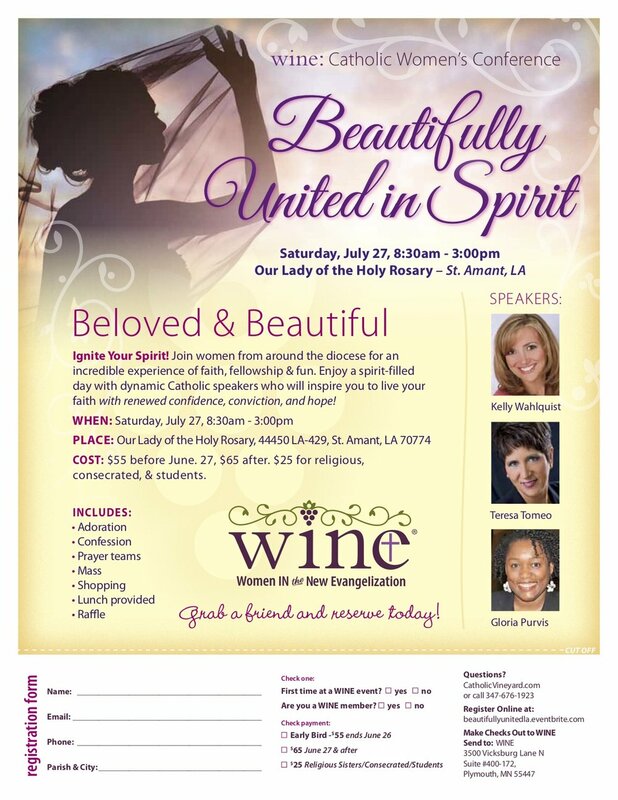 Please RSVP: wbrandenburg.btr@rcahybrid.org or (225) 257-9165. Are you looking for classical education and Catholic formation for your children? 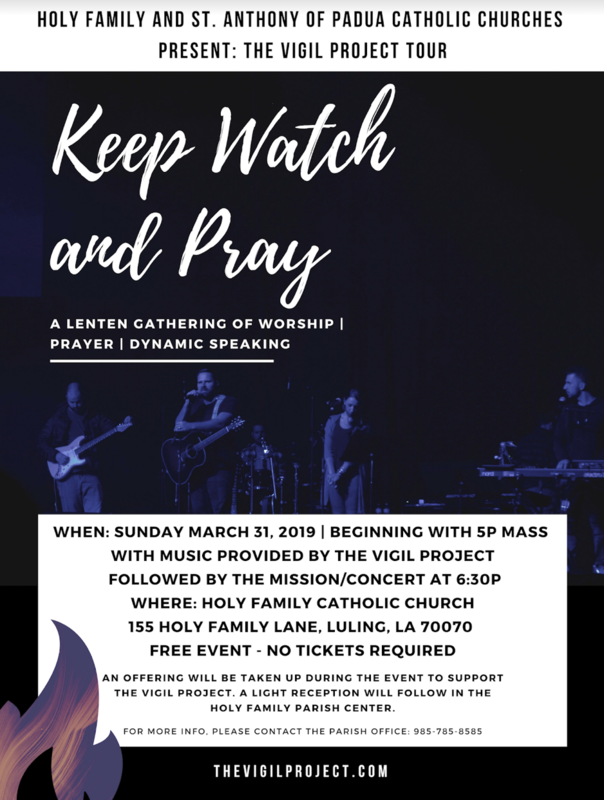 A Lenten Gathering of Worship, Prayer and Dynamic Speaking! All are welcome! Bring Your Family!